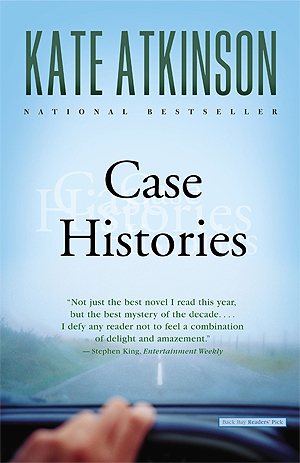 The first book in Kate Atkinson's Jackson Brodie Mysteries series, called "The best mystery of the decade" by Stephen King, finds private investigator Jackson Brodie following three seemingly unconnected family mysteries in Edinburgh Case one: A little girl goes missing in the night. Case two: A beautiful young office worker falls victim to a maniac's apparently random att The first book in Kate Atkinson's Jackson Brodie Mysteries series, called "The best mystery of the decade" by Stephen King, finds private investigator Jackson Brodie following three seemingly unconnected family mysteries in Edinburgh Case one: A little girl goes missing in the night. Case two: A beautiful young office worker falls victim to a maniac's apparently random attack. Case three: A new mother finds herself trapped in a hell of her own making - with a very needy baby and a very demanding husband - until a fit of rage creates a grisly, bloody escape. Thirty years after the first incident, as private investigator Jackson Brodie begins investigating all three cases, startling connections and discoveries emerge . . .